Crunchy and satisfying with a pure maple flavor, these sturdy cookies are easy to pack and transport, making them ideal for gifting. Preheat the oven to 350°F. Lightly grease a large baking sheet or line with parchment. Place the walnuts in a single layer on the baking sheet and bake for 8 to 10 minutes, until light golden brown and fragrant. Remove from the oven and let cool on a rack. In a large mixing bowl, beat together the eggs, granulated and brown sugars, maple syrup, and maple flavor. Add the melted butter and mix until smooth. Stir in the flour, baking powder, and salt until combined, then add the nuts. Divide the dough in half and, using wet hands, shape each half into a rectangle about 12˝ long, 3˝ wide, and 1/2˝ thick. Sprinkle the top of each rectangle with a tablespoon of the maple sugar. Bake for 30 minutes, until light golden brown and firmly set. Remove from the oven and let cool on the pan for 10 to 15 minutes. Carefully transfer the baked logs to a cutting board and, using a serrated knife, cut the baked dough on a slight diagonal into 1/2˝-thick slices. Saw the knife back and forth instead of pressing down, to keep the cookies from crumbling. Place the slices close together, standing upright on the baking sheet. Return to the oven and bake for another 20 to 25 minutes, until the sides begin to brown. Remove from the oven and let cool on the baking sheet on a rack. Store airtight at room temperature; they'll stay good for weeks. 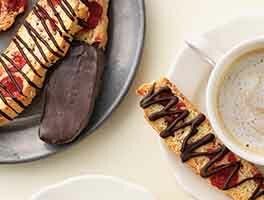 If you’d rather have more biscotti in a smaller size, use two baking sheets. Divide the dough into thirds and shape each third into a 10˝ by 2˝ rectangle (it should be about 1/2˝ thick). 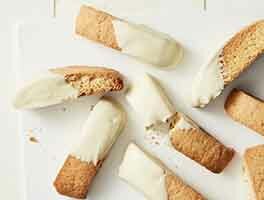 This will give you 45 smaller biscotti. Shorten the baking time by 5 minutes. The recipe is fine, simple and easy to make. I changed the mix a little by using up nuts we had leftover. Half almonds, half walnuts. Also used a Chef's knife to cut them after spraying them with a bit of water, no crumbling at all. I expected a bit more flavour but am looking forward to dunking them in my cup o' Joe. I was searching for an old recipe I made that called for oats, walnuts and maple flavor and this was the closest I could find. So I substituted 1 1\2 cups oats for the flour. It has been so long, however since making biscotti, I accidentally used baking soda instead of powder. Don't do this. I ended up with two giant almost flat cookies haha! They still taste delicious, and I wasn't going to waste the ingredients, however I will make them again using baking powder. 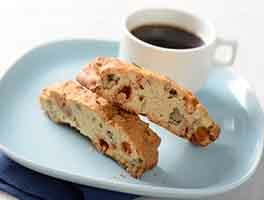 This is one of my favorite biscotti recipes. It's got such a rich, nutty flavor from the generous amount of walnuts and the sweetness level is just right for me. So tasty when dunked in a steaming mug of coffee! I prefer my biscotti really hard and dry so for the second bake, I drop the oven temp to 275 and let it go for a full hour. Because of this I don't toast the walnuts separately--they can get over-toasted during the extended baking time. If you get frustrated working with the very sticky dough, just pop it in the fridge for a few hours after mixing it up. It's MUCH easier to work with when cold. Just made them for my quilting group and I think they will be a hit (they are with me). Note however that baking soda, needed and called for in written instructions, is not listed in the ingredients list. I added 1 1/4 tsp after looking at other recipes. Could have, now that I made them, added 1 1/2 tsp. 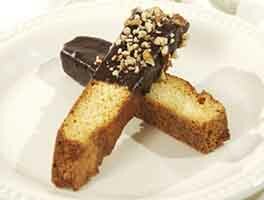 But this is a winner and so different from other biscotti recipes I've made. I tested this recipe out tonight for a Cookie Exchange I'm going to this weekend. I wanted a Gluten Free cookie, so I made this with the Measure for Measure flour. Since I don't like walnuts, I substituted almonds instead. They were delicious. My daughter is gluten intolerant, so I'm always looking for good GF recipes and this converted very well! My only comment is that I only got 20 biscotti out of the recipe. Granted, I cut them a bit thicker than recommended to ensure their integrity, but was surprised that I didn't get to two dozen. I need 50 for the exchange, so will double the recipe and try making longer, narrower logs. 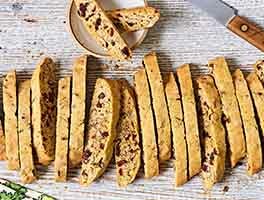 Delicious, simple no fuss biscotti! Cut out the white sugar. Didn't have walnuts today so used a "tranquility trail mix blend" chopped up to use instead. It had walnuts, almonds, dk chocolate, dried currants, cranberries, white chips, seeds...it made a great, unique cookie!! I had everything for this recipe on hand, so I made it. Totally surpassed my expectations. Easy and fast to put together. Used exact times in the recipe and it was perfect! Maria Paolercio from Concord, Ont. 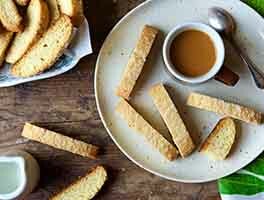 These biscotti are AWESOMELY delicious!